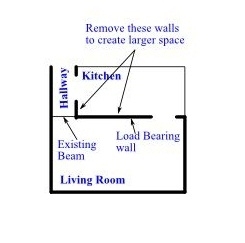 Removing a Wall Between Kitchen and Living Room: Step by Step Guide — Living rooms and kitchens are where most people entertain and spend the most family time. Removing walls to open up space between the kitchen and living room modernizes an older home, and can be part of an overall kitchen remodel project to take advantage of recent trends in new home building. Fewer walls and larger, combined rooms, are the trend in new homes because the home feels bigger and makes the best use of the space where people entertain and spend time with family and friends. 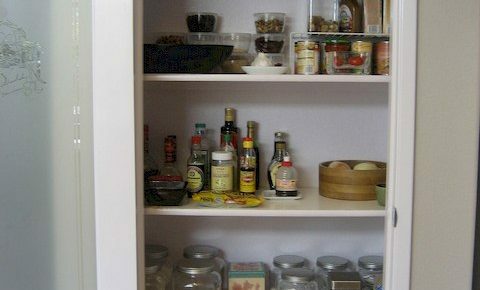 If you have an older home, you can join this trend to open up space between a kitchen and living room. Start by determining if the wall is a load-bearing wall, and planning to support the home during and after demolition and construction. Don’t forget about electrical, plumbing and HVAC which may have to be moved, adding to the cost. The structural support of a load bearing wall must be maintained during construction, and replaced with a beam when the project is finished. You can find a supporting wall by using a stud finder, to find a stud at least one foot from any doorway. Remove a small piece of drywall centered over the stud from the very top of the wall. If you see two horizontal 2x4s on top of the stud, the wall is a load-bearing wall. One top plate means the wall provides no support. 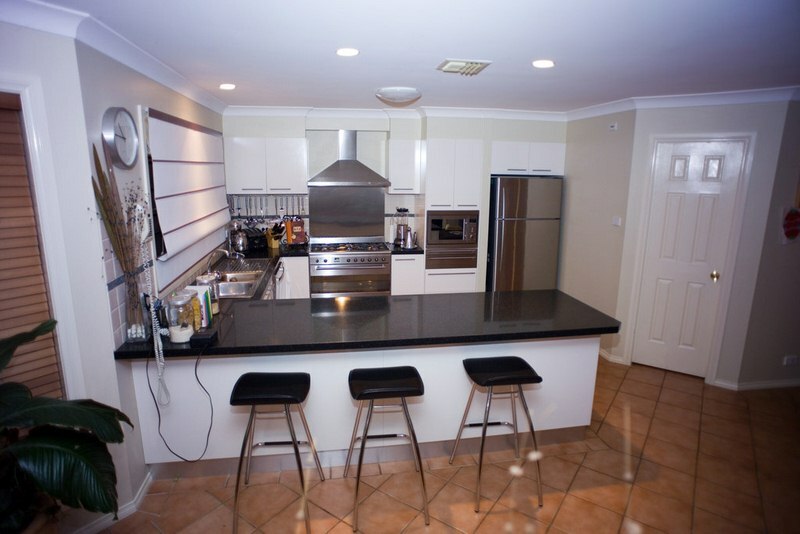 In this example project, two walls are removed to dramatically change the living room and kitchen space. 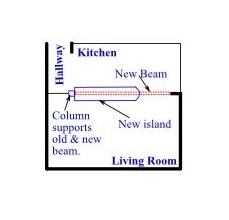 A new column supports the existing beam and the new beam where the two walls previously met at a corner. Removing the two walls opens up space between the kitchen and living room, making room for a new peninsula counter, or island, which adds a feeling of spaciousness for easy entertaining. Guests can sit at the new peninsula while you prepare a meal. Move switches to a different wall before demolition if possible. A new island or counter may require receptacles to be installed. Plumbing in the wall is more complicated. Water pipes and vent pipes can be moved without too many complications, but drain pipes are more troublesome. It may be best to call a plumber to move pipes unless you are very familiar with plumbing. Build a support structure out of 4×4 lumber about a foot away from the supporting wall. 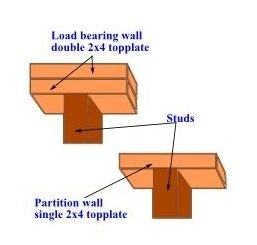 Use a 2×4 for the bottom plate and a 4×4 for the top plate. There will be a 4×4 at each end and one for every additional three feet of length – a nine-foot-long wall will have a vertical 4×4 at each end and two in the middle located three feet and six feet from one end. Build this support structure in place for a tight fit. Make cuts in the corners and along ceiling joints with a utility knife to prevent damage to adjoining walls and ceilings. Use a three-pound hammer to punch holes in the drywall along a horizontal line from one end of the wall to the other. Grasp the drywall with both hands and pull it off the wall, continuing until most, or all, of the drywall, is removed from both sides of the wall. Use a reciprocating saw to cut the studs at the top and bottom, and remove them. Finally, remove the top and bottom plates from the floor and ceiling. Install the support beam if required. 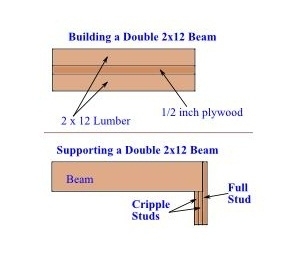 Three 2×4 studs at each end will support most beams, but building department code will specify this in advance. The beam must be tight against the joists or rafters it supports, or a sagging floor or roof will result. Nail three 2x4s together for each end. Get helpers to hold the beam against the rafters or joists and install the supports on each end. Be sure to get building department approval for a beam before you begin construction. Cover the beam and support structure with drywall if you installed one, or cover the gaps in the drywall on the ceiling and walls if you did not. 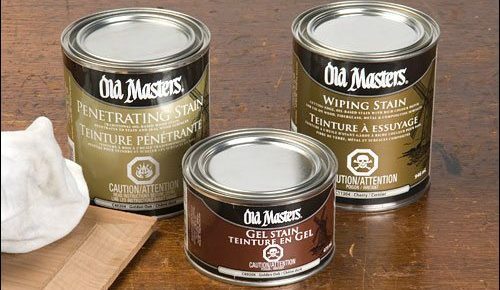 Tape and finish the drywall with compound and sanding as with any drywall project. To finish, prime and paint the work – removing a wall between the kitchen and living room to open up space, done!